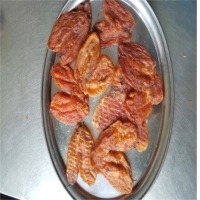 Send a buying inquiry to Dried Atlantic Cod Roe, from Baltic Dried Fish, Lithuania. Product Id 893920. Atlantic cod roe dried in the open air for as long as 24 hours and then smoked in a conventional kiln for from 2 to 3 days, using a cold smoke. Protein 21%, fat 12%, carbohydrate 3%; calorific value 207 Calories/100 grams roe.